Space: 1889 Relaunched! A Review. In 1988, Game Designers Workshop brought out the first “Steampunk” RPG. It was titled Space:1889 and was the brainchild of Frank Chadwick. Chadwick was and still is an award winning historical wargame designer who’s creation built on actual historical events to produce a Victorian Science Fiction RPG that was an instant success. It spawned a series of adventure books as well as two sets of wargames rules, The Soldiers Companion which covered ground combat and Ironclads and Ether Flyers which dealt “aeronaval” combat. There was even a boardgame, Sky Galleons of Mars, complete with plastic miniatures of the aformentioned ships. My friends and I got countless hours of enjoyment from adventuring on the Red Planet. But all good things eventually came to an end. Game Designers Workshop shuttered it’s doors in 1996 leaving Space: 1889 without a home. Over the years, various other publishers reprinted parts of the line. 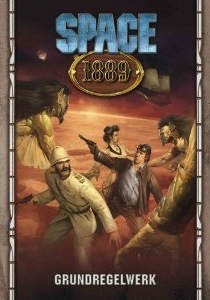 Pinnacle Entertainment came out with Red Sands, a plot point campaign for Savage Worlds set in the universe of Space: 1889. It is an excellent book and I highly recommend it. However, a lot of fans of the game were hoping for a new edition. In 2012, Uhrwerk Verlag, a German game publisher fulfilled those hopes. They brought out a new edition of Space:1889 in German. There was great enthusiasm for an English language edition as evidenced by the wildly successful KickStarter campaign to fund an English language edition. Angus Abranson and his crew at Chronicle City made it happen. I recently received the PDF and here are my thoughts on it. The system used in the new Space:1889 is the Ubiquity System. This system was originally used in Exile Game’s Hollow Earth Expedition. It has also been used to power Triple Ace Games All For One: Regime Diabolique and their own Steampunk RPG Leagues of Adventure. I highly recommend all of these games. They are a part of my gaming collection. If you want a really good look at how the Ubiquity system works then head on over to You Tube and simply type in Ubiquity System. There are some good videos on it. The one posted by Runeslinger is my favorite. One of the other advantages to using the Ubiquity System is that material can be ported over from the various game worlds without a lot of unecessary crunching of numbers. The background setting for the new edition has some interesting changes from the original. First of all, there is a lot more material on Venus and Mercury. Each world is explored in more detail than in the original. The German efforts at colonizing Venus as well as the political background for these efforts makes for some fascinating reading. The background setting of the United States is very fascinating. In the world of Space:1889 , the South won the Civil War due to the death of Abraham Lincoln from Typhus in the spring of 1862. Without his iron willed genius, the North was riven by petty political squabbling. In 1865, President George Brinton McClellan signed a peace treaty recognizing the Confederacy’s independence. By 1889, the United States is a rising industrial power while the slave-holding Confederacy is a rapidly failing nation. The other major change occurs with France. In 1871, the Paris Commune seizes power and voila’ the Democratic Republic of France is formed. By today’s standards, the DRF would be a Center-Left state but in 1889 it is a bastion of dangerous radicalism. There are other smaller changes as well as expansions of the original setting. All in all, I really like the new background setting. It provides endless possibilities. What’s Not In The Book. There are several things missing from the new version in terms of rules. First of all, there are no rules for Player Characters inventing things. In the original version, there were extensive rules for Player Characters being able to invent all manner of interesting things that had direct application to the game. Not so here. However, if you really would like to include rules to allow PC’s to invent things, HEX: Secrets of the Surface World works just fine. The other thing that was left out was the idea of racial “packages” for the various alien races. The designers have left it up to the PC’s to work out their visions of what a Canal Martian Scholar or a Venusian Lizard Man Warrior would be like. In my opinion, it’s not that big of a deal. If you feel as if there should be pluses or minuses for various stats, the system makes it easy to create. The PDF is a Beta version which means there still some editing work to be done. Having said that I can tell you that this is an excellent piece of work. I cannot wait to get my hands on the final hardback book. Overall, Angus Abranson and his crew have done an outstanding job of bring new material to one of my all time favorite games.